In 2011, Apple edged out Samsung to lead the list of companies that purchase chips. The Cupertino based company spent $18.8 billion that year versus the $18.6 billion spent by its Korean based rival, Samsung. But last year, Sammy opened up its wallet wider, increasing the dollar amount spent on chips by 29% to $23.9 billion. That represents 8% of the entire world-wide market for the silicon based product. For its part, Apple increased its spending on chips last year by 13.6% to reach $21.4 billion. That works out to 7.2% of the global market. Together Apple and Samsung took in 15 out of every 100 chips produced on the globe last year. The total value of all of the chips produced on the planet in 2012 was $45 billion. After Samsung and Apple, the top five chip buyers included HP, Dell and Sony, with market shares of 4.7, 2.9 and 2.7 percent respectively. The company that had the biggest decline in chip purchases last year was Finnish handset manufacturer Nokia. Dropping from 5th to 10th place last year, the company bought $5 billion worth of chips in 2012, down from $8.5 billion in 2011. 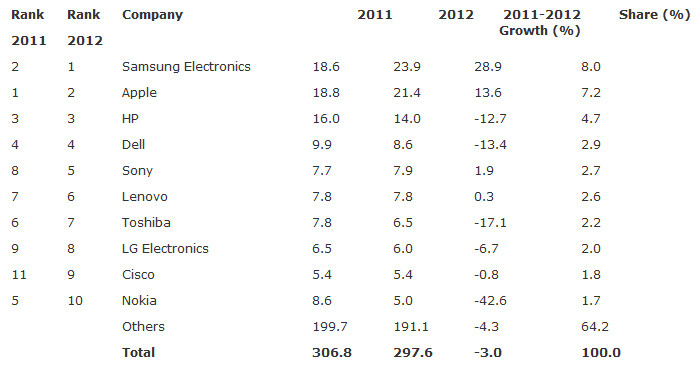 Despite the rather large increases at the top of the charts, overall semiconductor sales were actually down 3% to a total of $297.6 billion in 2011. Other phone manufacturers on the top ten list of chip buyers included Lenovo (6th) and LG (8th). If Samsung are one of the biggest chip manufactuers how come they are the biggest buyer ? Cant they manufacture for themselves ?! or the purchases were divisional through transfer pricing which is part of the buying figure given ? 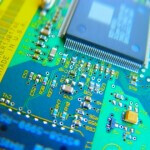 Samsung uses their own chips mostly in their flagship devices. They tend to buy chips for most of their other devices. I don't think this is true. And even if it is, their flagships are the only bestsellers and the only ones with expensive chips. I think Samsung treats their divisions seperately, so on paper it looks like "Samsung mobile" bought stuff from "Samsung displays", "Samsung chips" or whatever... Also, if they mean "processors", they shouldn't have used the term "chips". If you consider a graphics unit, an audio processor or any other chip into the equation, these numbers are just a bunch of nonsense that shows nothing we can understand considering enourmous corelations... Isn't a digital video processor in every Sony TV a chip? Same goes for watches, cameras, calculators..
Samsung is the boss this year.